Buying an Engine or Price Shopping? Our premium long block engines, import (foreign) and domestic, are completely factory remanufactured (NOT REBUILT) and come with at least 3 years 100k mile NATION WIDE warranty covering both the LABOR and ENGINE, whichever comes first. Also available are premium low-mileage used engines with warranty on both ENGINE & LABOR for 1 years. Including NEW pistons, rings, valves, main bearings, rod bearings, cam bearings, valve lifters, rocker nuts and swivels, timing chains, cam sprocket and crank gear, oil pump, and all gaskets and seals required for installation. Engine block cylinder walls are bored and power honed, cylinder head mating surface and block mating surface are machined, engine block is line honed, crankshaft is magnafluxed, turned and polished, connecting rods are resized and balanced in sets, camshaft is re-machined, rocker arms are re-machined, valve guides and valve seat areas are re-machined. It's cheaper to replace your engine rather than your vehicle! Get a remanufactured engine for less than what you would pay for sales tax on a new car. Installed or shipped right to your door. Our import low mileage used Japanese (& selected domestic models) engines are compression tested, inspected and have mileage usually less than 40K. 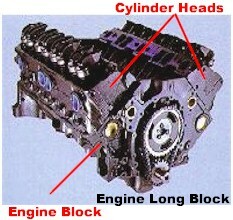 Although these engines often come with manifolds and other accessories, they are sold as long blocks (head and block assembly) for compatibility purposes. Don't confuse these engines with local junk yard or wrecking yard engines that usually only have 30-day warranties and high mileage. Get a low-mileage used engine for much less than what you would pay for sales tax on a new car. Our import low-mileage used Japanese transmissions and transaxles (standard or automatic) are completely tested and inspected with mileage usually less than 40K. Don't confuse these high-quality transmissions and transaxles with local junk yard ones that only come with 30-day warranties. It's cheaper to replace your transmission or transaxle with a low-mileage used one rather than a remanufactured or new one! Get a low-mileage used transmission or transaxle for much less than what you would pay for a remanufactured or new one. Our dyno-tested transmissions are completely remanufactured with premium parts and are tested before shipping on a special engine simulator machine for performance and quality assurance. It's cheaper to replace your transmission or transaxle with a dyno-tested remanufactured one rather than a brand new one! Dyno-tested remanufactured transmissions and transaxles come with a standard warranty of 3 year or 36k miles, whichever occurs first. For those who want the very best, this is the transmission of choice. Often times these transmissions come with a longer warranty than the original OEM factory transmission. Get parts at what professional shops pay for them. Take advantage of a vast nationwide network of contacts. Spend less money and time and let us do the searching. Beat the rising cost of fuel with hydrogen fuel kits, read more. Get an IRS tax refund for installing hydrogen, read more. Keeps your engine & the environment clean, read more. Pays for itself in fuel savings, read more. Price quote Products/Engines request form. We no longer sell carryout items alone (engines, transmissions and parts, etc.) only parts and labor quotes for inshop work only.